It’s tough as a brand to build great relationships with their customers. Sure, you can leave a few comments saying “Nice!” on your customer’s social media posts. But what about the connections that really matter? The true friendships you can establish as a brand with your customers? Very few brands succeed in doing this, and many even ignore it. Reason being is that it’s tough! It’s difficult as a brand to make people see you as one of them, and as a friend they can trust for better or worse. But the truth is that if you succeed, you will gain amazing results from it. Think of it this way: when you have a friend, and they tell you something, you are probably going to trust their word. Unless they are known for being liars of course. As a brand, the same principle applies! More people will listen to you, and more people will trust what you are saying. But that’s not the only benefit that comes with bridging the gap between you and your customers. In this article, we’re digging into the world of building better relationships with your customers, or more precisely, bridging the gap that is often surprisingly large, between brands and their customers. We’ve already spoken about the main reason to why you want to strive towards bridging the gap; to get more people to listen and trust what you are saying. But believe it or not: that’s not all. Another major benefit is that your customers become loyal supporters of your brand. And again, this can be tied together with the friendship parallel. If you have a friend, you expect them to stand up for you for better or worse, right? The same goes for you. You feel a responsibility to help them the way they have helped you. Because you don’t just abandon your friend all of a sudden just because you feel like it. Unless they’ve screwed up badly. For a brand, having loyal customers that are sticking with you no matter what is the most valuable type of customers. Not only do they work as marketing pillars for your brand (more on that soon), they are also the customers that spend the most. The probability of selling to an existing customer is 60-70 percent. The probability of selling to a new prospect is 5-20 percent. The bottom line? 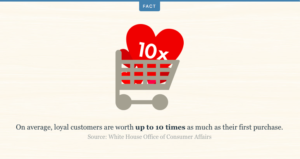 Make customer loyalty and customer retention a priority. Luckily, that’s exactly what I’ll teach you in this article. 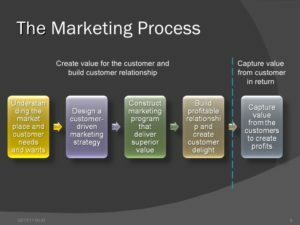 But first, I mentioned that I would talk more about loyal customers being marketing pillars for your brands and that is yet another huge benefit of bridging the gap between your customers. What this means is that loyal customers who trust your brand will willingly promote your brand simply because they love it so much, and want to tell their peers about their great experiences. For brands, this is the most valuable type of marketing. First of all, it doesn’t cost anything, other than developing a strategy of how you are going to treat your customers and build your relationship with them (that we’ll go into soon). Secondly, 92% of consumers are trusting peer advise. This is a number that brands only can dream of when they are managing their marketing. Therefore, the words of your loyal customers are super powerful. The concept of bridging the gap is to build better relationships with your audience. There are several approaches to how you can do this, but some are just vital. Otherwise, you’ll never succeed. Personality is one of them. If you want to build strong relationships with your audience that later is developed into trust, being personal is not an option. It’s a must. If you aren’t personal when building relationships with friends, the chances are, you’ll have a hard time making friends. And if you do, those relationships will be highly shallow, and they will be relationships that don’t talk about anything personal. You’ll end up talking about general things such as the weather, what sweater you are wearing, and a painting that is in the room you are in. Well, not only is it boring, but it’s also negative for your brand because you’ll struggle to gain that trust and retention you are aspiring to get. Most large brands are afraid of being personal because they believe that as soon as they are playing in the big leagues, they need to be careful, boring, conservative, and strict. In other words, the opposite of a personality that builds powerful relationships. More like a personality that pushes your customers away from you. However, there are a few brands that have successfully been able to create a personality that is fun, modern, and personal. 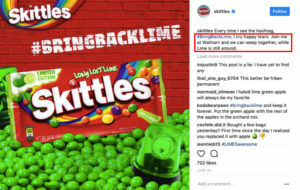 Skittles is one of them. Now, just because you are personal doesn’t mean you need to make your personality fun and exciting. If you are within an industry that is highly conservative, and have customers that resonate with a conservative image and language, there’s nothing that says that you should change that just because you become more personal. The most basic to being more personal is by writing you and I. It’s a simple yet an important first step to improving your relationships. When you write you and I, you make every encounter your customers have with you a conversation. What’s more, writing you and I helps keep people’s interest longer. Another powerful, and quite obvious way to be more personal is to mix in emotions. Emotions help humanize your brand, and show that you aren’t just a fancy logo and brand name. You show that you are, just like your customer a person with real feelings, opinions and thoughts. 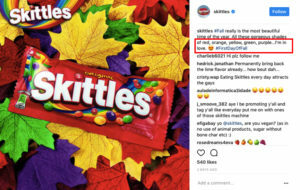 Skittles uses “cries” in their marketing on Instagram, which is considered one of the most personal things you can do. If you cry together with a friend, you know you trust them. And you increase the trust while you are doing it. In other words, it brings you closer each other. Therefore, using cries isn’t always a bad thing that makes your company seem weak. Instead, it can show your true personality and show that you are more approachable than people might think. The key to building relationships with people is by actually interacting with them. You can’t become friends with someone without ever talking to them. Therefore, you as a brand need to encourage interactions. You can’t always expect your customers to approach you for a chit-chat. You also need to take initiative. To get the conversation going, questions is a great trick. When you ask questions, hopefully, you’re going to get responses back. At least, that’s the idea behind it. It’s difficult to interact with people when you don’t know who you are going to talk to, but when you have encouraged your audience to make the first move, you can step in and meet them in the comment section of your post. There are many types of questions you can ask, and there’s often a lot of confusion regarding it. But the thing is that when you want your questions to ultimately lead to an improved relationship with your audience that bridges the gap, you need to be highly selective with the questions you ask. Sure, you can ask yes or no questions, but how engaging are they, really? And how personal are they really? If you want to build deep and personal relationships, you have to ask deep and personal questions! When you ask questions, the idea is to receive comments/answers, right? And the whole idea of why you wanted comments in the first place was that you wanted to engage with them, and ultimately build better relationships. Well, that means you have to put great emphasis on the way you interact with the comments as well. To build more personal relationships, you want to make sure you engage with your customers on a personal level. If your customer share a personal story as a response to your post, make sure you share a personal part about you as well! If your customer don’t comment a very personal answer, try to steer the conversation in that direction. The most personal you are, the more they’ll see you as a human, and the more they’ll trust you! The great thing with the comment section is that it allows you to engage with your audience one on one. When you are asking questions in your post, the questions aren’t very personal in the sense that you are asking everyone the same question. But when you can continue the conversation with your audience, that’s when the real magic happens. Have you ever had a friend that all of a sudden changed personality? Well, no matter if you have or not, the same principles and results will come out of it when a brand does it. When you start building relationships, and bridge the gap between you and your customers, your customers will love you for who you are. Every time they engage with you, it will feel familiar and comfortable. That’s how the human works! But if they are engaging with you one day, and you have changed your personality, going from being highly conservative to using slang and jargon the next day, they’ll quickly run the other way. Because it won’t feel genuine. You aren’t staying true to your core values. Nobody wants fake friends, right? Well, changing personality over night is the definition of fake from the customer’s perspective. If not, it’s highly confusing at least. Therefore, it is extremely important that you have a clear brand personality that you can follow, and that remains the same no matter if someone engage with you today or 3 years from now. Your brand personality should also be decided based on the people you are trying to reach. In other words your target audience. Your personality and language should be based on the language and the personality your audience has, but it shouldn’t be posy, because if that is the case, your customers will be able to see through it and lose both trust and respect in you. The reason you want to use the same language as your customers is that it allows you to build better relationships with them. Think of it like this; when you are talking to a really old person, are you using your true language that you always use? Or do you adapt it for the situation you are in? It’s probably the latter, and as a brand, you want to be a place where your customers can go and talk in a language that they always use, and speak to someone who uses the same language. 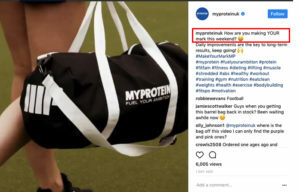 @MyProteinUK uses a humorist personality and tone because it resonates well with their audience! That way, you’ll have easier time building relationships with them. We’ve already talked a lot about engaging with your audience by asking questions in the caption of your post, and then interacting with the people who have answered in the comment section. But the truth is that there are plenty of more ways to engage with your audience. The time when you are building your relationships the most is when you are talking to your customers one on one. And just like all of the other examples, the same principles go for real life. Social media is no different. You can be more personal, and build better relationships when you are talking to someone one on one compared to if you’re in a group. With social media, you can talk one on one on a variety of places. The two best places that will make the most impact is through private message (most social platforms offer some sort of messaging feature but not all), and secondly through the comment section on their posts. Something that you can do regularly is comment on your customers’ posts. Start following your most loyal customers, or the people who you want to convert to loyal customers, and start engaging with them. Again, what you comment is important. If you only write “Nice”, for example, not much will happen with your relationship. If you instead leave a thoughtful and genuine comment like “How was your trip?” if they have made a post about their weekend trip, you are slowly but surely entering their private life, and asking questions about it. This will eventually lead to them seeing you as a brand rather than just a brand. You can also use private messages. This allows you to chat with your customers in the most private way on social media, which also helps establish an intimate conversation. When you take your time to send genuine messages to them, they’ll understand that you value them, and they’ll talk about their amazing experience with your brand. As a brand, you need to bring value to your customers for them to tune in. This goes for any type of marketing as well. If you don’t provide any value, you won’t attract any new customers. This is also especially important for social media, because the social media landscape is more competitive than ever, and if you don’t give people a reason to tune into your social media and engage with you, they won’t. Your audience needs to feel like they are getting something from your interactions and social media posts. It doesn’t have to be pure cash as some people think, but it can be as simple as giving your customers some “not yet released” inside information. In fact, that is a tremendously clever way to keep your customers engaged and loyal because it shows that you trust them. Having good relationships with your customers is essential for both customer retention and word-to-mouth marketing. By reducing the gap between you and your customers, you ensure that they’ll buy from you time and time over, while also promoting your brand to their peers. Don’t believe you are superior just because you run a company. Be human, show your personality, show your feelings, and your customers will have an easier time connecting with you and like you.